Gardeners spend hours carefully cultivating their favorite plants, whether they are delicious veggies, flavorful herbs, sweet fruits, stunning flowers or luxurious grasses. It hardly seems fair that unwanted weeds barge in and take advantage of all that work, and seem to sprout up without any effort. Fortunately, there are many ways to control weeds without losing your mind or your garden to their influence. Buy only high quality, certified grass seed and select a variety that is best suited for the amount of sunlight and traffic expected in the area, as well as its ability to withstand drought, insects and disease. The healthier the lawn is, the less room there will be for invading weeds to use. Avoid light, frequent watering or overwatering. Plants that receive deep, infrequent watering generate extensive root systems. Strong roots foster thick, hearty plants and lawns that withstand stress, preventing invasions from pests, weeds and disease. Fertilize your lawn and garden on a regular basis. Be sure to first test your soil to determine its pH and add any soil amendments necessary to ensure ideal growing conditions. This will help keep your turf, garden and plants healthy so they crowd out any unwelcome weeds. Always cut lawns at the proper mowing height. Never cut off more than 1/3 of the grass blade at one time. Keep mower blades sharp to avoid tearing plant leaves. Scalping or mowing too closely will stress your lawn, while weeds thrive under these conditions. A dense, healthy, vigorous lawn will resist the intrusion of weeds. Properly cultivate lawns and gardens. By routinely tilling flower beds and aerating lawns, you reduce compaction and thatch. This allows air, water and nutrients to flow freely through the soil, making them more available to plants. Healthier plants will grow more vigorously, taking room and nutrients away from weeds. Densely plant and generously mulch flowers, trees and ornamentals. By eliminating space and sunlight, weeds won’t have the needed room or nutrients to gain a foothold in beds and gardens. 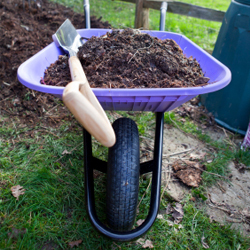 Always be careful mulch does not come in contact with plant stems and trunks as this can create areas of excessive moisture where fungus and disease problems can arise. Plant ground cover or landscape hard to grow areas. If weeds are a persistent problem and you have difficulty growing grass in certain areas of your yard, consider alternative plants or decorative material such as landscape rock or other hardscaping. 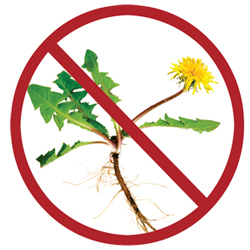 Stop weeds before they can seed or develop extensive root structures. 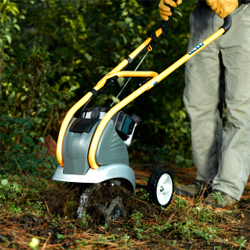 Remove existing weeds by pulling or hoeing them or use an all-purpose weed killer of your choice. Then apply Preen, corn gluten or similar pre-emergent controls to prevent new weeds from germinating. Weeds may be a problem in any landscape, lawn or garden, but the more steps you take to eliminate them, the more successful your efforts will be and the fewer weeds you’ll see.